Lightroom is hands down, the best mobile editing app for professionals. It provides you with lots of powerful tools like HSL tab, Selective edits, Healing, Masking and much more. But using it on a smartphone is not the same as using it on the desktop. Firstly, it’s not very intuitive and secondly, you don’t get the keyboard shortcuts. But what if I tell you shortcuts do exist on the Lightroom smartphone app. It’s buried deep under the UI and not even advertised. So, here are 9 shortcuts which will make your Lightroom editing on mobile a lot faster. Read: Lightroom vs Snapseed: Which is a Better Photo Editor? On the Lightroom desktop, you can enable masks by pressing the Alt key and then work accordingly with the Highlights and Shadows. However, on mobile phones, you don’t get the alt keys. Thankfully, you can enable a similar mask with gestures. Here’s how. While you are working with the White slider, tap on the image. This will create a black mask on top of the image and when you move the slider to the right you can see colorful pixels on the image. These pixels represent the overexposed region. You can rest the slider to the point where you see a minimum amount of color pixels visible on the mask. This point denotes the maximum your image can be pushed without losing details. Similarly, when you do the same with the black slider, a white mask is created on the image. Moving the slider towards the left will create pixels on the mask. You can rest the slider at a place where a minimum amount of pixels are visible on the mask. The same gesture works for the Dehaze & Sharpening tool as well. The one worth mentioning is the Masking tool under the Detail section. 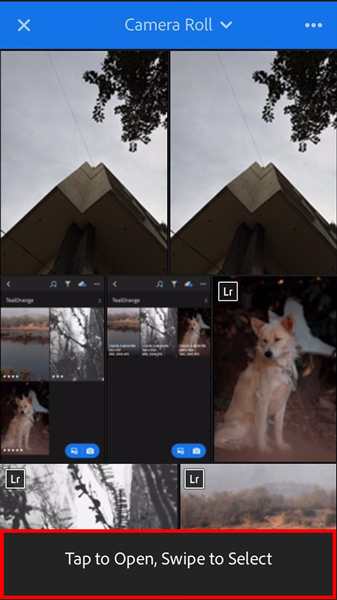 When you apply Sharpening to the image, Lightroom mobile doesn’t show the portion of the image where sharpening is being applied. The Masking tool lets you control the effect of sharpening to the certain portion of images. Do the same gesture, tap on the image while you are working with the Masking slider and it will create a luma mask on the image. It will show only those parts of the images where the sharpening effect is being applied. You can control the sharpening by moving the Masking slider. You can view information such as File type, Photo Info, EXIF Info, and Flags Ratings as an overlay on top of the image in your albums. This can be easily enabled and controlled through View Options in the Settings but switching back and forth the views is quite tedious. When you long press the image in the grid with two fingers, it enables the Info overlay. Repeating the same gesture will help you to toggle through the Overlay options. Pro Tip: You should rate your photos based on your workflow. I usually leave 3-stars to my half edited photos, 4-starts to fully edited not exported photo, and 5-stars to the ones I have exported. 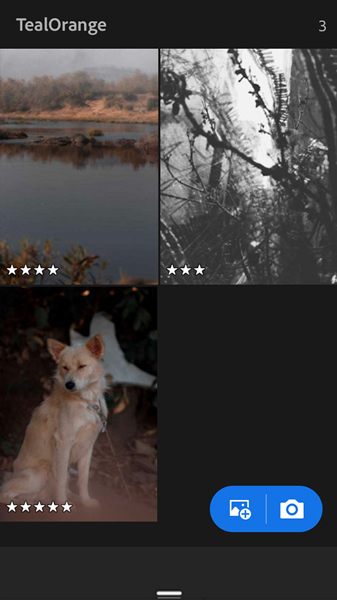 By enabling Info Overlay for flags and ratings, I can quickly decide what photos have to be edited just by a quick glance at the thumbnail. In iOS, you can also edit your photos before importing them in Lightroom. While selecting the photos, instead of long pressing and selecting them, just tap on the photo. This will open the editor for you, once you are finished editing click the right symbol on the top right corner. Now, the photo will be imported with the edits. This saves a lot of time as you don’t have to wait for the photo to be imported and you can start editing right away. If you have imported a lot of photos in your albums then the grid looks quite cluttered. You can use the pinch-to-zoom gesture to manually resize the grid. This really helps to quickly resize the thumbnail of the photo. If you are not already using Lightroom inbuilt camera app, you should reconsider it. You not only get RAW images but also HDR. It’s already enabled on iOS but on Android since it is still in testing, you have to enable it from the settings. Click on the hamburger icon at the top left corner and go to Technology Previews. Enable HDR support and now when you open the LR camera, you will get an option to switch to HDR. Lately, Lightroom brought the feature to create your own custom presets to the mobile app. This feature existed on the desktop version and there was a workaround to bring them to the mobile app until now. Once you have edited the photo, you can tap on the 3 dots on the top right corner. Select Create Preset from the popup menu. You can choose the edits that you want to be part of the Preset. Choose an appropriate name and Preset Group. Now, you can see your own presets under the Presets tab. Recently, Lightroom released an update which made importing photos much quicker on iPhone. 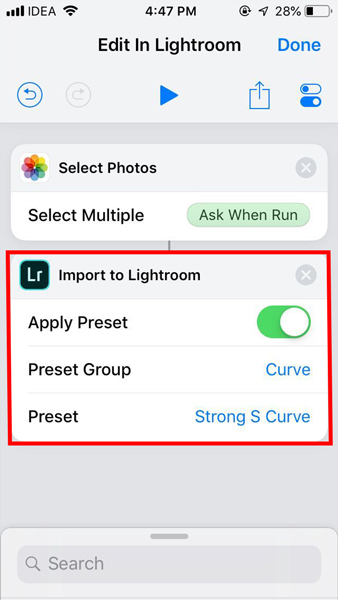 You can build a Siri Shortcut for Lightroom which lets you easily import photo(s) in Lightroom with just a voice command. Go to Siri Shortcuts, create a new workflow. The first step would be to choose photos from the album. So, the first command would be Select Photos. 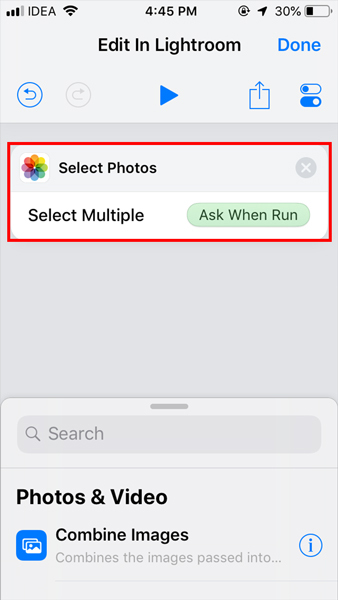 You can also choose Multiple Photos if that’s what you want. Select Ask When Run on the next Prompt. Next command would be Import to Lightroom. Now here you have conditions such as Apply Preset, Preset group, and Preset. So, you can choose to apply your preset automatically at the time of import. This option is a game changer if you have the same preset for all your photos. If you are too lazy to create the shortcut, I have already created them for you. The first one lets you apply preset to a photo you just clicked and the second one lets you choose the photos to import. The Siri trigger is Edit this Photo. For Android, I tried to do something similar with Google Assistant Routines but all you can do as of now is open Lightroom. Unlike Lightroom Desktop, you cannot sync your edits to other photos on the Lightroom mobile app. 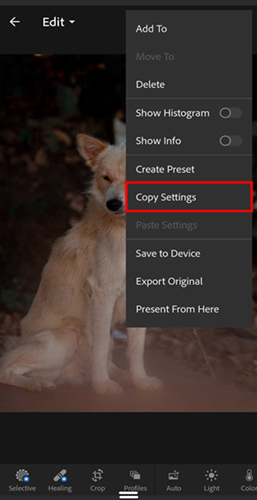 As a workaround, you can copy settings from a photo and paste it to other photos which are similar to syncing your edits. You can also selectively choose the settings you want to copy from the photo. Pro Tip: Even if you don’t want to have the same edits for all the photos you can use the edit as a starting point for your edit. You can tap on the slider instead of dragging it all the way up. On Android, a single tap in either direction increases/decreases the effect by 2 points. While on iOS, the same gesture increments the effect by 5 points. To reset the effect you can double tap on the slider and this also works for the RGB curves. There is no setting in Lightroom mobile to modify this gesture and its effect. Your favorite Lightroom Mobile Tips And Tricks? If you are able to apply these hacks in your daily editing workflow, you will really see a difference in your editing speed. Let me know in the comments which one you end up using the most.